I have owned a G-4 model for 14 years. My parents had a Kirby also so I have essentially grown up with one. I have pretty bad allergies so I felt owning a Kirby would be best for removing all the dust, etc. The bags fill up fast with an amazing amount of dirt and dust, so you know it’s cleaning so much more thoroughly than other vacs. I also use the shampoo attachment and love it for cleaning the carpets in my house. I have to pull out the instruction manual to make sure I set the parts up right, but once it’s set up, it’s easy to use and goes quickly. It does not leave the carpets sopping wet for hours like so many commercial rug cleaners do. And because the dirt in the rugs is regularly cleaned by the Kirby, there’s no muddy residue building up under your carpets like what usually happens with inferior vacs and traditional carpet cleaning. Sometimes the stubborn stains in rugs need scrubbing by hand (I usually do it after I’ve cleaned the carpet already and it’s still damp.) Then you go over the carpets again with regular vacuuming, wait a few hours for the carpets to dry, and wah-lah, you have clean, fresh carpets! The down side to this is that sometimes blackish stripes end up on the carpet while shampooing. It seems to come from the vac, I’m guessing the wheel, but am not sure. I just scrub them out by hand if I notice them. I also rinse all the parts out in the tub afterwards, otherwise all the wet dirt and debris end up drying on the some of the parts restricting air flow a bit and cleaning ability later, or leave some additional stains on the moist carpeting. What I really like is that I can clean my carpets much more often and use environmentally safe and unscented cleaners for the shampooing. It also has an attachment for carpeted stairs which is helpful. I also do most of my house dusting with the attachments, it does a much better job at getting into crevices, etc. than using a cloth and just spreading dust around. I also have used attachments for cleaning inside my car, using it to clean leaves off the driveway (so quick once it’s set up) and for blowing up large inflatable items. (Directions for these are in the manual provided). My husband and I were probably a bit naive when we bought the Kirby G4 vacuum years ago, not realizing the price could be negotiated. We paid about $1600 for it, but it has certainly paid for itself in all the carpet cleaning alone it has done. Will never get rid of my Kirby G4: I bought my Kirby G4 in 1993 or 4, don’t remember exactly when because I have had it so long. Before that I bought other vacuums every year like clockwork. The G4 has more than paid for itself over the years and I would not want any other kind of vacuum. I read a review that Rainbow Vacs outdo a Kirby, however I know three individuals who had Rainbows that literally self destructed after a few years of use. None of the three were in ‘abusive’ environments. My Kirby on the other hand, has vacuumed up after 5 kids, numerous grandkids, dogs, cats and whatever else ever since the mid 90’s with only a few parts replaced. Dependable and durable. Offer me any thing else? Well you can offer, but I will never get rid of my Kirby. Buying it was one of the smartest economical moves I ever did. Kirby G4: Owned the Kirby G4 vacuum for about 16 years and never regretted the purchase. Attachments are great, sometimes you can find one-size-fits-all parts like the crevice tool and extensions alot cheaper than Kirby accessory prices. The strong suction assures me of a good cleaning with hepa filter cleaning the air and not throwing dust back out. I use it on everything including the car, pet, ceiling, fans, dusting, shampooing, upholstery, and bedding. When the bag is near full, it’s a great way to pick up fireplace debris then changing out the bag. 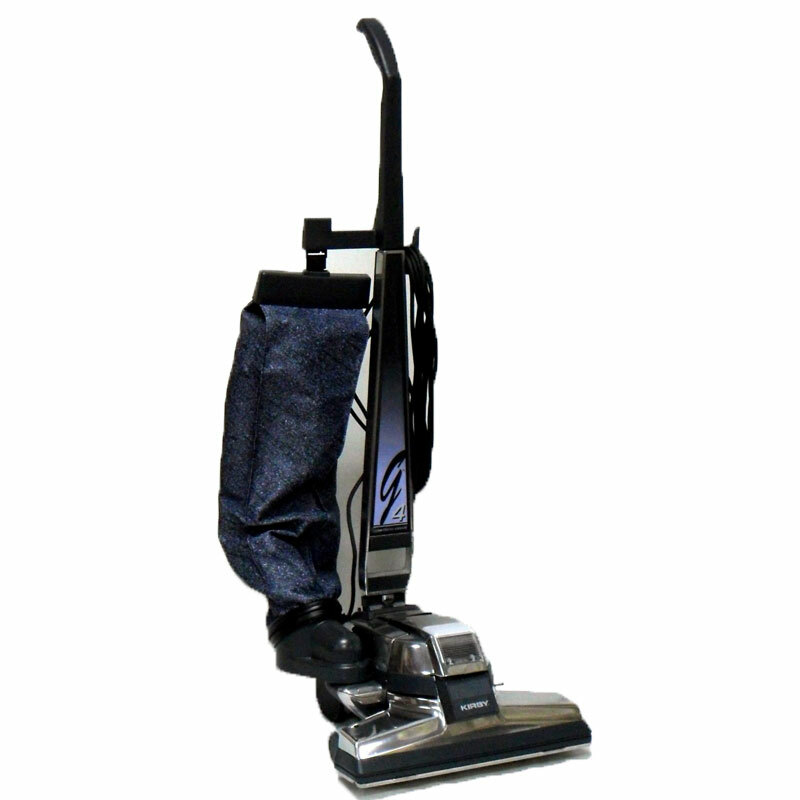 The Kirby G4 vacuum cleaner gets the edges of carpeting to baseboards extremely well. There is also a collection area that holds small change, stones, and metal debris like screws that sometimes make it easy to sift thru and discard if not needing these items. The only things I’ve replaced are the belt, hose, and floor attachment since which cracked at the base connection. I have all the attachments imaginable. Only complaints are that this machine is very heavy, changing out the carpet power head to hose attachment is a nuisance, and the floor attachment gets hair/debris around the tiny roller wheels that you have to take off 4 screws, clean, and reattach. Mild nuisance considering the great reliability and satisfaction of the job being done well. Kirby ought to make a stick-style vacuum for easy clean ups so you don’t have to always pull out the “beast” as I call it. I have had a Kirby G4 vacuum for over 15 years now. For the most part I love it, it has great suction power and has yet to lose any power. It vacuums my bare floors just as well as my carpeted ones. Overall it is one of the best vacuums I have ever owned. The only problems I have had is it is a little on the heavy side and the bags for it are a little pricey, but overall you cannot beat the fact that it is still going strong after 15 years. A Question: I have owned a wonderful second hand G3 for 10 years, and have just bought a G4 in beautiful condition, also second hand. We are replacing our carpeted living room floor with a laminated wooden floor. Does anyone know if I can clean this new floor with my Kirby, please? The G4 is bulky: I’ve had my Kirby G4 for 15 years. They are expensive & somewhat bulky. After seeing some of the newer & lighter vacuums out there, I think I’m ready to trade the old gal in.